N orth Berwick Rugby Football Club’s (NBRFC) mini teams are set to tackle their upcoming games in style after their vital sponsorship deal with renowned house builder, CALA Homes (East), was renewed for a third year running. The UK’s most upmarket, major home builder has just announced it will be continuing the teams’ sponsorship for another year following two successful years supporting the club. The NBRFC will be using the much needed funds to invest in kits, coaches and training equipment for the 150 children they have attending each week and have high hopes for the season ahead. Each year, the mini teams play in a number of festivals and tournaments, which see them competing against other teams from across Edinburgh, East Lothian and the Borders. CALA Homes’ continued commitment for the next 12 months allows them to concentrate all their efforts on the pitch. Ian Dove, President of the NBRFC, said: “We continue to be very grateful to CALA Homes for their long term support of the North Berwick minis section. “This is the third year they have supported the club and they are a vital part of our continuing success. Their sponsorship allows us to continue to provide a great experience for all our young players and for those who coach and support them. “Our mini squads are a central part of NBRFC and the wider community, and this sponsorship will help our young people to develop and improve their sporting skills, which in turn helps them in various other aspects of life, while keeping them healthy and active. Founded in 1952, the NBRFC has always been keen to nurture young talent and, historically, has one of the strongest mini rugby sections in Scotland in terms of results and playing numbers. 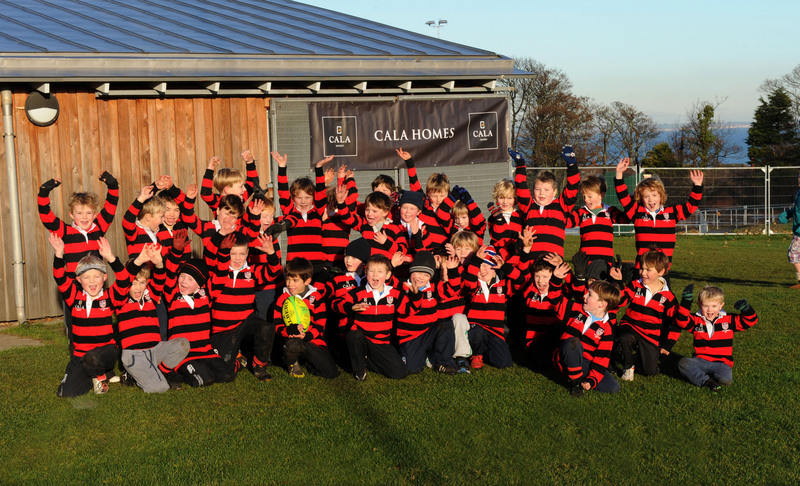 CALA Homes (East) also sponsor the annual minis rugby tournament, which was held in September of this year and attracted 350 players from across Scotland. The local children’s football club, North Berwick Colts is also sponsored by CALA and recently supplied their budding players with a range of new sports jackets for their training sessions. This sponsorship is agreed for 12 months and was officially renewed at the start of March this year. Sarah Stanger, Sales and Marketing Director at CALA Homes (East), voiced her continued support for the NBRFC. She said: “CALA Homes is passionate about community spirit and you couldn’t get more to the heart of that than with local mini rugby teams as the games bring everyone together. “We look forward to seeing the club continue to give their players the fantastic opportunities they have done for so many years and you never know, they may even pave the way for a couple of Scotland’s future stars”. CALA is committed to investing in the communities surrounding its homes. It currently has two developments in the coastal town of North Berwick including its award winning, sold out Gilsland Grange development and nearby Priory Meadow development offering spacious and elegant family homes.